Time to talk about CLAMP IN WONDERLAND 2, in details. After so much waiting (more than a year), we can finally watch it over and over again and pay attention to little details. I took 66 screenshots, and I wanted to take more but I thought that, for a review, 66 was more than enough. Well, some low and mid-quality versions appeared, yeah, but I decided I would wait for a proper High Quality version before posting about it, that way I would do just one post instead of spamming about it. I had hoped that this version would be released on Saturday, Sunday at the most, but my hopes were wrong. I waited and waited and nothing about a HQ version, so I ended up posting nothing at all ^^” I’m sorry about that, and I would like to thank everybody who contacted me to let me know that those versions were available, thanks you guys! However, I knew had ordered the DVD, and I also knew that she rips DVDs like no one else, so I contacted her and asked for a HQ rip, and she kindly conceived it. The video is completely awesome and I loved it, but I will write a more detailed review of it on this coming weekend. 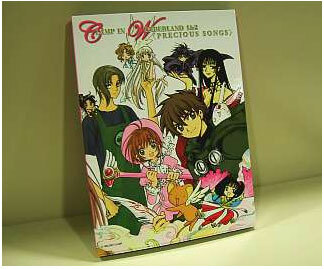 For now, you can get a High Quality version of CLAMP IN WONDERLAND 1 and 2, plus the special Pamphlet, after the cut! You can download the CD of CLAMP IN WONDERLAND 1 & 2 via this torrent link, provided by Nipponsei, or through their mIRC channel. I’ll come back later with comments, let’s listen to the music while we wait for the video’s release! The booklet zip includes the package illustration, interviews with CLAMP, Maaya Sakamoto and ROUND TABLE, the short comics and the official song lyrics. If you wish to listen to the full CD tracklist or to have the Booklet scans in an even higher resolution, please download it from Nipponsei through the links above. I LOVED action! so very much! Maaya Sakamoto is particularly amazing in this one and it’s perfect for CLAMP IN WONDERLAND. It’s extremely catchy (what? I’m already addicted to it!) and the beat is very good (now I know why the japanese keep talking about it’s fast tempo). The lyrics fit more than I had expected, too, they remind a lot of the first CLAMP IN WONDERLAND. I thought Oh! Yeah!! was okay, but nothing more than that. It’s definitely more rocky than I had imagined it to be. In Japan, CLAMP will release the DVD of the animation clip “CLAMP IN WONDERLAND 1&2 1989-2006 (PRECIOUS EDITION),” featuring characters from all CLAMP works. We’d like to commemorate this occasion with a CLAMP net tour project. You can get special wallpapers available only on this site by traveling to various CLAMP-related websites and collecting keywords. For hints, please go to the CREATIVE LOG. Please look for keyword banners like above. When you collect all 17 passwords from the websites and type them in the box below, you will be directed to Secret Room, where wallpapers are waiting! Let’s get on a travel!! The official website of CLAMP in CARDLAND has been updated with more news about the cardgame. *RG Veda hasn’t been formally announced yet, but judging by the package illustration, we can assume it’s the 8th series. The pattern of 2 of the 3 cards featuring brand-new CLAMP illustrations has been revealed: one of them will feature Kamui and Subaru, and other will feature the Two Sakuras. The pattern of the 3rd card has yet to be announced. Upperdeck has added a section with the rules and information on how to play the card game. Check their website for more pictures of the cards. CLAMP in CARDLAND will be released on the middle of November. The Creative Log section of CLAMP IN WONDERLAND official website has added some information about the exclusive special pamphlet that will come as one of the many privileges for those who purchase the 1st Edition of the DVD. The cover of the pamphlet will be drawn by CLAMP, and I’m pretty sure it’s another new illustration since they said the picture is still a “top secret”. The site also mentions a “‘gorgeous’ guest’s autograph page” to be among the contents. As you can see, the CD cover pairs up with the DVD one. 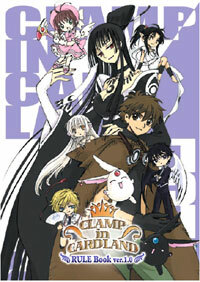 – DVD tall-case-size Digipack with illustration draw by CLAMP. 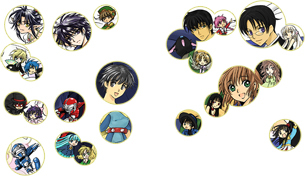 – Exclusive Interview with CLAMP, Maaya Sakamoto and ROUND TABLE. – Exclusive short comic drawn by CLAMP. – Exclusive early promotional CLAMP in CARDLAND card. CLAMP IN WONDERLAND 1&2 is scheduled for an October 24th release, costing 1575 yens. 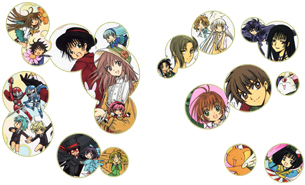 The official website of CLAMP IN WONDERLAND 2 has been updated. The Creative Log section is now formally open, which is a sort of a production diary. 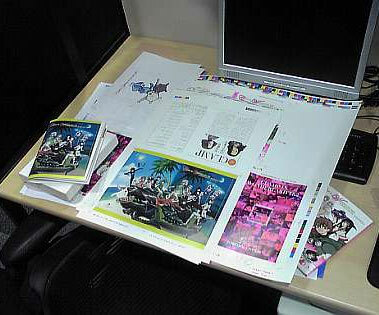 The booklet will contain the original storyboards and picture continuities made by CLAMP of CLAMP IN WONDERLAND 1 and 2, an interview, among other contents. 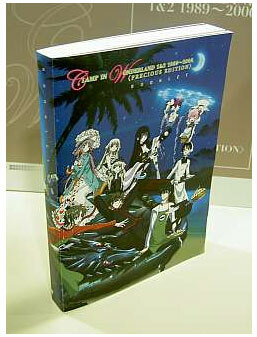 CLAMP IN WONDERLAND 1 & 2 DVD Box hits the stores on October 26th. ontogenesis-san got her box of CLAMP in 3-D LAND 4th Series and she was kind enough to scan the special booklet that comes with it and the package illustration drawn by CLAMP. The booklet includes a picture of Vampire Fye’s Figure. You can see the pictures in here.